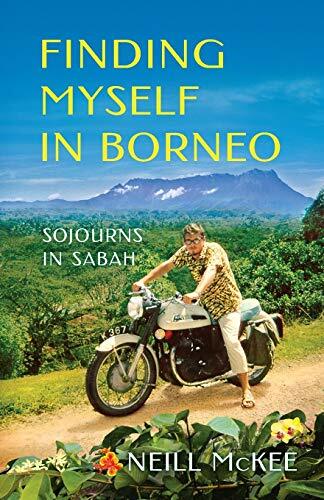 Finding Myself in Borneo is an honest and buoyant chronicle of a young Canadian man’s adventures during 1968-70, while teaching secondary school as a CUSO volunteer in Sabah, Malaysia (North Borneo). Travel with Neill McKee on his unique journey through vibrant Asian cultures as he learns the craft of teaching, the Malay language and local customs, and gains many friends in his small community. He climbs the highest peak in Southeast Asia—Mount Kinabalu, has a love affair, and navigates Borneo’s backwaters to make his first of many documentary films. McKee travels by freighter to Indonesia, where he discovers the scars of that country’s recent genocide, a contrast to his hilarious motorcycle journeys in Sabah with his American Peace Corps buddy. They make a hallucinogenic discovery—North Borneo is, indeed, J. R. R. Tolkien’s famed Middle-Earth of The Lord of the Rings! The enterprising duo establish the North Borneo Frodo Society, an organization Tolkien joins. McKee’s second Sabah sojourn and other return trips offer the reader the opportunity to match the early anecdotes to what in fact happened to the land and people who touched his life, and he theirs. I was born in a small, industrially polluted town, Elmira, Ontario, Canada and I aspired from a young age to leave and find a more green, pure and sunny place to live. I touch on this in this present memoir but am now writing another on my childhood and youth. I studied psychology, philosophy, and playwriting in university but didn’t know what I wanted to do with my life in 1968 when I finished. I saw a poster for CUSO and went into the office to apply. I had an interview the next week and around a month later was accepted to go to Asia. After another month, I learned I would be posted to Kota Belud, Sabah, Malaysia – a small town near the coast of North Borneo. I taught secondary there for two years but also began to learn about documentary filmmaking. This eventually led me to a career and further studies in communication for development and I wrote a number of books and articles in this field – fairly technical and academic works. I returned to Sabah for a second sojourn as the deputy director of the CUSO program in the early 1970s, but then went back for filming. I returned twice more when doing documentary films and then visited Kota Belud on New Years 2006. In all, I had a great many stories in my head from these visits but never had the time to put them down on paper. So, when I retired from my international career at the end of 2012, I decided to try. I attended graduate-level workshops in creative nonfiction at the University of New Mexico when we moved to Albuquerque in 2015. That’s when I began to write, revise, get feedback, and revise again. I hired a good literary editor to give me even more in-depth feedback and eventually completed the manuscript for publication. We held an open house at our place in Albuquerque and invited friends to buy the book and taste delicious Malaysian food my wife cooked. It was an informal event to trade stories. We have many friends here with international experience. In fact, I only began writing when I went back to university to study communication at Florida State University (1987-88). Before that, except for a few articles, I had concentrated on making documentary films—sort of a “one-man crew”—I did the research, shooting scripts, filming, editing and production supervision. I sometimes hired soundmen and editors to help and always brought in writers to polish the narration. After Florida State, I turned my Masters’ thesis into a book on communication for development and wrote two more after that, plus many articles. But it wasn’t until I retired that I had time to study and write in a more popular style. I found it wasn’t easy. I had to have very thick skin and revise, revise, and revise again after feedback. I generally have a number of stories to tell and start to write them one by one. I jot down the main title and key ideas in each but no real plan. I take material from one and put it in another as I go along. I would say it is more of an iterative process, gradually expanding, embellishing, refining, cutting and replacing the various parts, adding description, dialogue, historical information, etc. as I go along. I work about 5 to 7 hours 6 to 7 days a week. I leave plenty of time for exercising and relaxing. When I walk, I listen to books. If I am writing, I can do about 3 to 5 pages a day. But I spend a lot of time researching, revising, checking, communicating, and now doing promotional work on my Borneo book. I hire a literary editor, copy editors, proofreaders, a designer and this takes a lot of time too. I believe Finding Myself in Borneo went through at least 50 revisions. A small spiral note book for ideas and MS Word. Yes, to some extent. I am influenced more by ratings. Be prepared for hard work and a lot of frustration. After about 8 rejections and 2 offers from commercial publishers, I decided to hire a good designer and self-publish. The publishers who wanted to publish my book wanted total control – possibly full re-edits and didn’t want to put any significant money into publicity. They would take 80% of the royalties I would earn by self-publishing and I didn’t think this was a good model. So, I decided to set up an LLC and self-publish through IngramSpark which has worldwide reach. I also hired my own publicity people. Yes, I am a member of Southwest Writers in Albuquerque and am gradually gaining friends who want to exchange with me and give feedback on each other’s work. It is a group of over 300 writers, so it took some time to identified people who were interested and a good match for mutual help in the development process. People interested in adventure travel, memoirs, Asian culture and history, self-growth and career choices, and learning about other cultures, religions and languages.